Gary Lineker says Diego Maradona is in danger of becoming a 'laughing stock' after his unsavoury celebrations threatened to overshadow Argentina's win over Nigeria. But Argentina looked to be heading out with the game locked at 1-1 but Marcos Rojo's 88th-minute volley was enough to send the South Americans through at Nigeria's expense. 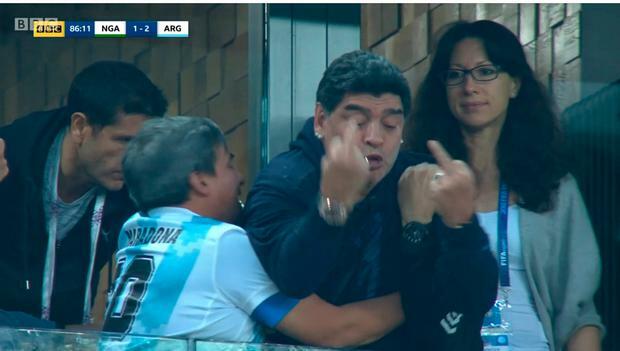 As the camera panned Maradona's spot int the stands the 57-year-old was captured swearing at supporters below using his middle finger. "Maradona is in danger of becoming a laughing stock, I'm afraid," said Lineker during post-game analysis. Rio Ferdinand, who appeared alongside Lineker as a part of the BBC's coverage of the game, also condemned the gesture. "His career as a football player on the pitch was up there with the best, but unfortunately there are moments like this that do arrive. It is not nice to see that," said Ferdinand. Before the game Maradona had heaped praise on England's start to the tournament. "They want to go out and play. I don't think it's the coach. It comes from below - they are under-17 and under-20 world champions," said Maradona. "It seems to me that the likes of Sterling, Kane, Vardy and Stones give the ball another touch," he told Venezuelan TV channel Telesur. "This speaks clearly that the boys are being forged in a way England did not have before. "They don't hit the ball across half the pitch. No, they want to go out playing and they found some other attributes with respect to the opponent they had [Panama]."